Shortcake made its first appearance as a vendor at two local street fairs this month. Here's what I learned and what I wish I knew beforehand. I live in an area in New Jersey where the towns have street fairs a few times a year. They are well attended by local families (think: lots of strollers, baby carriers, and middle-schoolers bopping around). I'd been thinking about getting a table at fairs like these for over a year, but wasn't sure if it would be a good fit and worth the investment. About 2 months ago I decided to give it a shot, and signed up for two fairs. My thought was that these are my target customers - and since we sell a physical product (family photo albums), I should do my best to get them in their hands, get their feedback, and increase awareness of what we're doing. That alone will be worth it. I was a bit nervous before hand. Would this work? Was it worth the money I spent to buy materials and samples, and to pay for the booth space? Would anyone come talk to me? What if it rained? Should I have bought one of those Square card-reader-things in case someone wanted to buy a gift card on site? To prepare, I bought a new pop-up tent, a tablecloth, and a tablerunner with Shortcake's logo. I designed new business cards and a brochure for people to take, and bought a brochure holder to display them. I already had a supply of sample albums to browse, and so brought those plus a few of the boxes the albums arrive in for display. That should cover the bases, I thought. Beyond that, I will learn at the fairs what I'm missing and get ideas from other vendors. The morning of the first fair, my husband & I drove over to set up around 9:30 am. The fair was from 11am - 5pm, but people started showing up a little after 10am, so I was glad I was all set up a bit early. Lesson #1: Be set up and ready to go before the fair starts. People will be there early. For the first half hour, no one stopped by my table. My doubts crept in. But then I remembered something from my days as an admissions counselor at college fairs - people attending fairs don't like eye contact. They want to browse, see who's there, take it all in, and NOT be pressured to come talk to you. I tried a few different things (smile, avoid eye contact, check my phone)...but without exception the best activity for me to be doing that encouraged someone to come browse was writing in my notebook. I had brought a notebook with me to take notes of any ideas I had or customer questions to follow up on. And whenever I was writing in that book, someone would come by and start looking at albums. Then I would look up to smile and say hello, and we would start talking. I think it must have something to do with me being available to answer their questions, but not paying direct attention to them so they won't feel pressured. Lesson #2: Bring a notebook and write in it when not talking to people. This makes you more approachable. I saw lots of people walking by with their families and friends who were just there to enjoy the day and see what caught their eye. People were looking at my booth and smiling, nodding, etc., probably thinking "Oh that's nice. She makes albums." and moving on. I needed something to help grab their attention and make them curious about what we do. Lesson #3: Get a big sign that people can read while they're walking past. Put something on it that makes them curious to know more. I ordered a new A-Frame/Sandwich sign after the first fair that says "Turn your Facebook & Instagram into a Family Heirloom", with some pretty album photos on it. I thought that might pique people's curiosity at fair #2. I was pleased with the interactions I had at the first fair. But even though I had a lot of conversations with people, I didn't have a way to follow up with them because I hadn't captured their contact information. They all took brochures and business cards, but that left the next step up to them. I wasn't happy with that. Lesson #4: Have a simple system for capturing contact information. Here's what I had on the table. Note the silver bucket and papers at the top for the raffle entries (email captures). At the next fair, I put out my fancy new street sign and waited for people to come flocking over saying "Ooh you make albums from Facebook and Instagram?? Tell me more about that!" No one came over. And I left that sign out for at least two hours. The first lesson I learned at the second fair? Lesson #5: Always be testing! A.B.T. This is the one I'm hitting myself in the head for. I had a two-sided sign, and I printed the same message twice, thinking it would be good for people to see the same sign no matter which way they approached. The problem? It wasn't the right message! What I should have done was printed two different signs, one for each side, and tried both out to see which one attracted more people. Face. Palm. After I took the sign away? You guessed it. People started coming over, curious about what I do with my nice-looking albums, and how the process works. It's hard to know for sure, but my guess is people saw my sign and either 1) "Turn your..." sounded like they had to do work (and people do not like doing work) or 2) thought they knew enough about what we do just from the sign and were not curious to learn more. Next time I will try some different messaging that is more emotionally-driven. Thumbs down. I'll do better next time and test two different signs. Lesson #6: Look for the 'lightbulb' moment. Once I realized my pretty sign had the wrong words on it, I started paying more attention to my conversations with people. I listened to see what questions they were asking me, and when exactly during our conversation did they have the "Aha!" moment of realizing this is a product they want. For me, it happened when they realized, "Wait - so you do all the work?" "Yes, we do all the work." "Oh my gosh. This is amazing." Ding ding. This was a great learning experience for me in rethinking my customer messaging and value propositions. As founders, we often are so intimately familiar with all the services we can provide customers, that we struggle to distill those values down to a simple, meaningful message that a customer can easily understand and connect with. I still don't have all the answers, but these conversations with people who were new to our service helped clarify a lot of things for me. Lesson #7: If you have a physical product, you need to get it in people's hands. Last lesson. Something that is difficult for us at Shortcake is conveying the value of a physical product that you don't see and hold until after you pay for it. 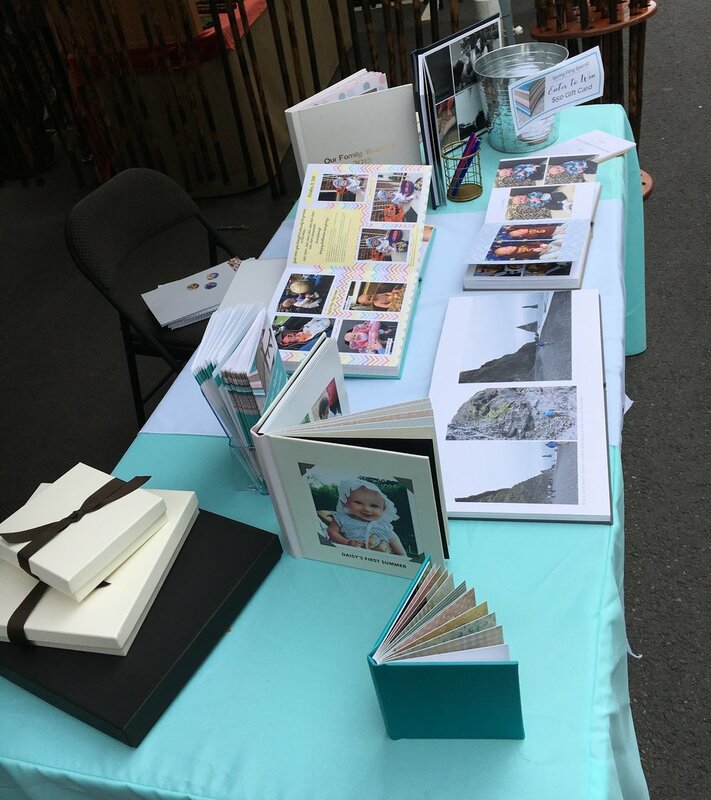 It is very hard to communicate the difference in quality of our albums vs. mass-market photo books by images only. When a customer held the album in their hands though? The connection was almost instantaneous. I could see it in people's faces when I handed them one of our albums to look through. I could see them realizing 1) "Wow, this is really nice." and 2) "I want this for my family." In conclusion - we will be going to more street fairs. The upfront investment is a pain, and the weather is a HUGE factor in turnout, but the connection with customers is extremely valuable, not to mention the amount of marketing research you can accomplish in just a few hours. So for me, it was definitely worth it. Do you have any tips for maximizing the value of street fairs? Please share! Or questions for me about my experience? Post a message in the comments, or email me at coralee@shortcakeinc.com. I'll update this post with the best tips/questions I receive to help share the knowledge with others.